Don’t water the dirt – it only wastes water! Like many parts of country, Florida has its share of challenges when it comes to lawn maintenance. Scorching sun and bad soil in many parts of the state wreak havoc with the dream of a nice, green lawn. My wife and I just recently had to re-sod our front lawn due to the amount of trucks driving on it during our recent renovation, so I have been paying particular attention to those homeowners who seem to be beating the odds. I noticed something today that made me stop in my tracks. A neighbor was very diligently watering the dirt in his front yard. While there were some patches of grass that could be saved, much of it was a total loss. And now, it is a wet, muddy total loss. I am not a lawn expert by any means, but if there is one thing I know, it’s that grass won’t grow without seeds. Watering the dirt just wastes water and makes a mess. I then started equating this to people, and how we try to develop and train our team members. If my neighbor was missing something regarding how to get his lawn to grow, what are we missing when it comes to getting our team members to grow? I’ve seen many instances where people want to throw training at a performance issue because that’s the only method they know of. If a particular skill is under developed, training can help. However, if the team member in question is lacking desire, confidence in the system or process, or belief in him/herself, no amount of training will change the outcome. Sad, but true. From what I have seen, the one ingredient that seems to be missing, and is of the greatest importance, is the direct relationship between a team member and their supervisor. A friend told me about a recent situation where she happened to run into her boss someplace, and they ended up having a great conversation. To her, it was inspirational to talk with her boss in such a casual, non-work setting. They did talk about work, but it wasn’t the typical day-to-day what’s going on kind of conversation. She said it was more like two people chatting, rather than a boss talking to a subordinate. She said it made her feel better about her job and her ability to move up through the company. So she had the training (water) and the foundation of experience (dirt), and now she had the seed of inspiration and confidence building that she needed to REALLY grow as an individual and a professional. So turn off the sprinklers if you don’t have any seeds, unless all you want is a muddy front yard. I think the last time I was in Washington D.C. (before 2 weeks ago) was around 8th grade. So when I got to visit our nation’s capitol for legitimate business purposes, I decided to play tourist for a while and see the sights. 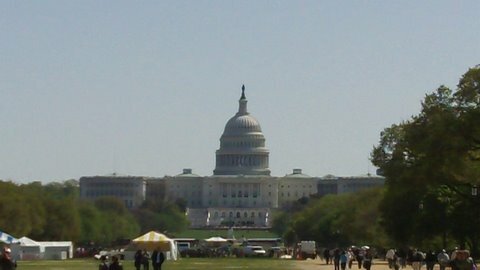 I spent most of my time around the “mall” area, near the Capitol Building, Washington Monument and Lincoln Memorial. I don’t know how far I walked that day, but I was on my feet for about 8 hours. My “dogs” were barking (as my friend Peter says), but it was worth it to see what I got to see. Got off the Metro, and there was the Washington Monument. What I didn’t know (but learned on my “Secrets of DC Walking Tour) was that much of the stone used to construct this was donated from other countries, and it was Ulysses S. Grant who finally set aside the resources to finish it after work had stopped for various reasons during the Civil War. That’s why you see a change in color of the stone a little less than 1/2 way up. If you turn around on the mall, you see the Capitol. I didn’t get very close to this… the Cherry Blossom Parade was winding down and it was time for me to meet my group for the walking tour. I did get a picture though. 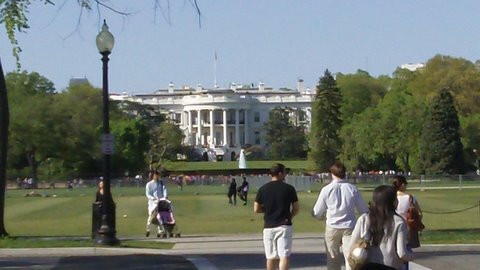 As I walked past the Washington Monument, I looked North and there was the White House. This picture was taken from Constitution Ave., a little later in the day (and a few more miles on the shoes). 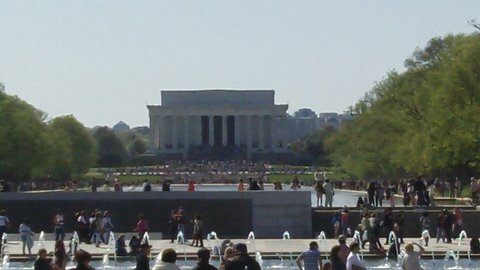 On down the mall lead me to the Lincoln Memorial. 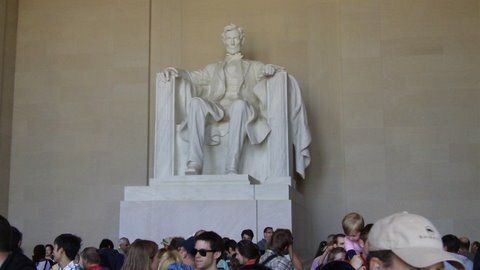 Being a huge fan of National Treasure, I just had to get down there to see Abe. 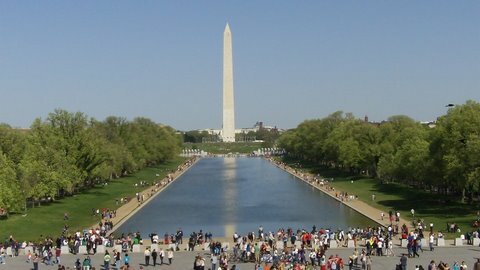 And here is the Washington Monument from the Lincoln Memorial. 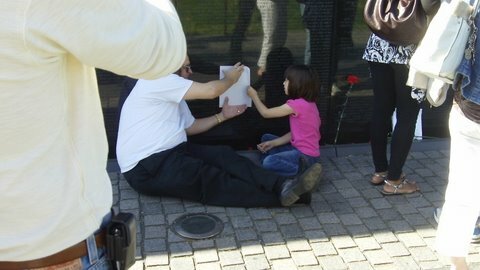 The little girl used a crayon to rub on the paper over the name of a family member. Amazing. I tried to make it into the American History Museum and the National Archives, but they were jam-packed, and I had a meeting to get to. I did get to see Stan, and he was kind enough to let me capture part of his performance. 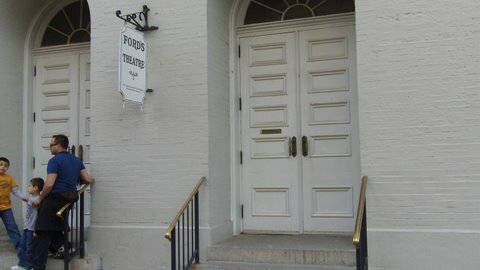 Last stop was Ford's Theater. I missed the last tour of the day, but it was neat to see the building and the... gift shop. The only souvenir I bought was a stone drink coaster adorned with Abe's face and the postage stamps he has appeared on. This was actually a significant find because Linda had made me coasters out of similar material early in our relationship, and she stamped on it! Of course across the street there is a big gaudy sign in front of a house that announces "This is the house where Lincoln died". Splendid. So there is my trip to DC. I had to get this posted before Linda and I leave for Puerto Rico and the Southern Caribbean this week (a trip she earned through her company!). 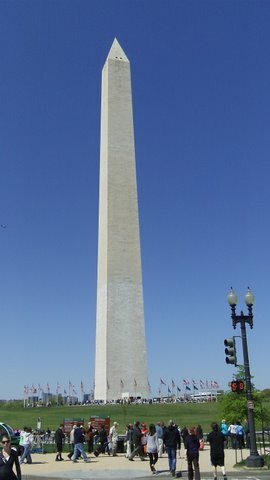 By the way, I also learned that the D.C. is a tribute to Christopher Columbus. But it's District of Columbia, right? Yes, but when you refer to a city, you use the feminine form, not the masculine. Incentives – what do YOU do? A few years ago, a person that Linda works with earned an incentive prize for her efforts in a particular area. The reward was an item that most people would want, yet the recipient refused it and said, “here’s what I’d really like…” Linda reminds me that I told her that an incentive is only valuable if someone wants it, and that if the recipient was telling her she wanted, we should provide that. Here’s where I go back and forth, and would love to get your perspectives. I still truly believe that incentives need to be meaningful, but how far do we go? I know it’s probably a little pie-in-the-sky to think that everyone is going to be appreciative that they got something, and recoginze the fact that they were rewarded for their efforts. This brings to mind the topic of meaningful recognition in general, but that’s another post for another time. So the question I pose to all of you is: How far do you go to create incentives that you think people will want? What are the pros and cons? Leave a comment or send us your thoughts by clicking here. On Saturday, I was flying from Orlando to Washington D.C. for an IAAPA meeting. As I approached my gate in the terminal (at 6:00 am, I might add) I heard something you rarely hear in an airport- singing. Someone was singing, “have a, have a, have a great day”. As I turned the corner, I saw that it was the employee at the Hudson News stand. I would find out later that his name is Tony. I started watching the reactions of people as they either made a purchase or walked by and Tony would sing. One time it was “have a great day”, another it was “you are our best customer”, “come back and see us”… He had a few signature lines that he performed with gusto each time. At first the reactions ranged from joy to mild curiosity, with only a few annoyed glances. I had to find out more, so between “shows” I asked Tony about his background. Here is Tony in action. Tony told me that the day before he had a full terminal give him a standing ovation. 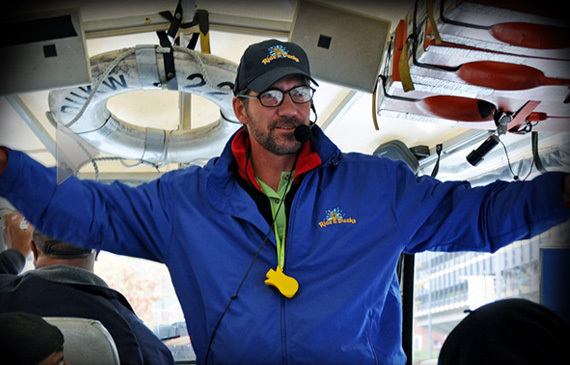 When was the last time that you were compelled to give a standing ‘O’ – especially at the airport – or for customer service that you received? Tony must be doing something right. I should point out that not everyone was in love with Tony’s antics. Some people just wanted a newspaper and to be left alone. That didn’t deter Tony. Same gusto, from 4 to 2. The great thing about his actions is that it had a positive impact on the passengers who didn’t even buy anything. As I walked up to speak with him, I overheard someone say, “I hope he sings this time.” He was definitely the topic of conversation, which made the time waiting in the terminal just a little more bearable. I even heard other people mimicking his signature, “ch ch” as we got on the plane. How many Tony’s do you know? Is he the norm or the exception? The big question is, can this be duplicated by others in other companies? How about in YOUR company? That’s tricky. It seems like Tony would act this way no matter where he worked. So it’s not the environment and I hate to say it probably wasn’t the training, either. To me this sounds like a person who has made a choice to make the best of the situation, with Hudson News and their customers as the beneficiaries. To me the lesson here is twofold. 1. Great service starts with great hiring, and is supported by caring leadership. Put the wrong person with the wrong outlook in front of your guests and get ready to spend lot time performing service recovery. Square peg/round hole doesn’t work for carpentry, and it certainly doesn’t work with people. 2. If your expectation and standard is “Tony”, don’t settle for less, because that’s exactly what you’ll get. Make your standards wherever you want, but be ready to support those standards with recognition and feedback. And in a case where someone is just not cutting the mustard, be ready to “set them free to pursue other opportunities”. You’ll be doing yourself, your team and the employee a favor. Nothing breeds poor performance more than keeping unproductive employees around past their expiration date. So if you are ever in the Orlando airport between 4 am and 2 pm, get yourself over to gate 54, terminal B and listen for Tony. He’ll be the one you want to hire. While out and about yesterday, Linda and I saw a sight that we’ve seen many times before (especially on a warm Spring day here in Florida), but this time something different occurred to me. 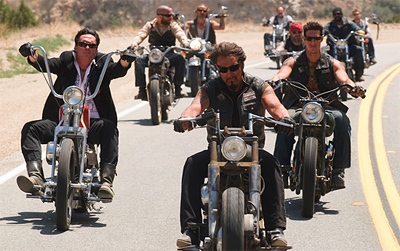 Sitting at a stop light, we heard the unmistakable roar of numerous motorcycles pulling up next to us. Two out of the four bikers were sporting matching black leather vests with the name “Chrome Angels” on the back. A fun side note is that my band played at a number of their fund raising functions over the years, but more importantly I realized that everyone wants to belong. Whether we are talking about bikers, cheerleaders, coaster nerds (like me), movie buffs, or animal lovers, people naturally gravitate toward others who have similar interests, likes, and dislikes. No matter how “independent” some people claim to be, there is an underlying desire in most human beings to be part of some sort of community. Nowhere is this more evident than online. The fact that you are reading this blog shows that you and I both want to connect to the larger world, and we are using technology to do that. If you have a Facebook, MySpace, or Twitter account, you know just how many other people share the desire to connect, to belong, to be part of something. If you are not connected through any of these services, trust the rest of us. Tons of people out there want to connect. So here’s the question (you had to know this was coming! )… what are YOU doing to make your workplace the kind of experience that people want to be a part of? Part of allure of these in-person or online communities is that people get to express themselves, others are willing to listen, and they don’t feel pressure to be someone they aren’t. That is a powerful formula for an empowered and productive workforce. Thanks for letting me feel a part of your community! I hope all of my friends in the attractions “biz” got to see this week’s episode of Undercover Boss since it highlighted an amusement park company. In the hot seat was Joel Manby, President and CEO of Herschend Family Entertainment, trying his luck with entry level jobs at various parks. If you didn’t get to see it, click here. We’ll wait. Like many episodes of UB, Joel finds people in his company that work hard, have great stories of survival and in some cases, want his job! I particularly liked Albert, who pulled out his laptop to sport his latest Roller Coaster Tycoon creation! What really struck me about this episode was Joel’s reference to values. Herschend works on the foundation of Christian values, and I know many other companies have a set of guiding values that drive them as a company, and set an expectation of behavior for their employees. By what we got to see, the value system is alive and well at Herschend’s properties. So the big question is not IF your company has a set of values or guiding principles, it’s whether or not those values are known by each employee and supported through all levels of management. I think both these examples show that values can (and need) to be more than a poster on the wall, more than a wallet card, more than a power point slide in orientation. That’s the easy stuff. Instead, values have to live and breathe in each action of each employee. They need to be tested, communicated, followed, understood, explained, and role modeled. That’s the not-so-easy stuff. We’ve all been in situations that test our commitment and understanding of our personal and professional values. We’ve made tough, unpopular decisions that we KNEW were right, even though others may not understand them. How many times does a wallet card really help in those situations? The reality is that we often create these “learning aids” because we think people need to be reminded to do what’s right. What REALLY influences that behavior is when employees see their leader and the people around them living up to the values that the company says it stands for. A poster on the wall is just words, and what speaks louder than words?